Clubs collect attendance. It is a tradition. LARC has been doing it since day one. The funny thing is that no one, to my knowledge, has ever made use of the data on our sign in sheets. In fact, the last time anyone ever sees it is after they check off their name. Except for me, that is. I file them. You no doubt have noticed that the sign in sheets have changed a bit over the last year. Instead of a blank sheet, call signs were prerecorded so you only had to check a couple of boxes. The result was more legible, but not in format easily shared. Two months ago a bar code appeared next to your call sign. Here is what that is all about. By scanning the bar code representation of your call sign into a file, it can then be joined up with the official list of club members and shared with everyone. In essence What follows is the result. So if you are not on the list, and you are a member in good standing, please let me know. Also, let me know if you find any errors. 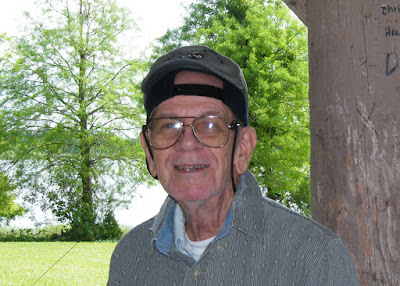 Jeff (Luther) James passed away Friday, May 12th. He was preceded by his wife Barbara Jean James nearly one year to the day. Jeff is survived by his son Glenn and his daughter Vicky. There will be an informal service Saturday, 10 AM - 12:PM at the Gentry-Morrison Funeral Home 3350 Mall Hill Dr, Lakeland, FL 33810. 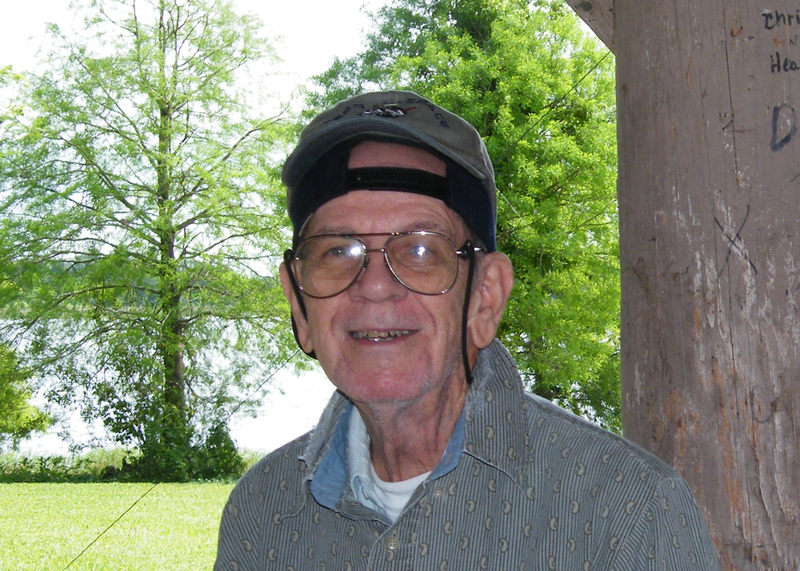 LAKELAND - Luther 'Jeff' J. James, Jr., 83, passed away at his home on May 12, 2017, surrounded by his family. 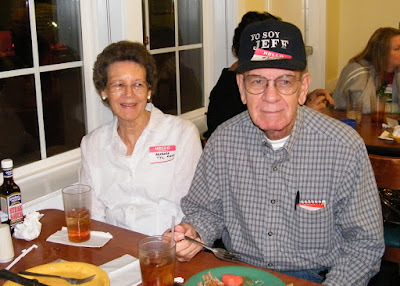 Jeff had fought a long battle with Alzheimer's disease. Jeff was born and raised in Lakeland, FL. He was married for 60 years to Barbara Britt James, who preceded him in death on May 15, 2016. 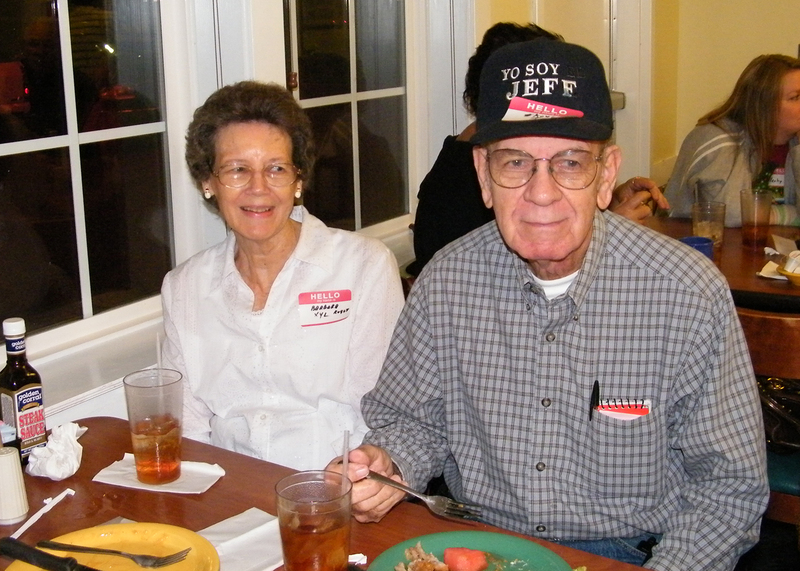 Jeff graduated from Lakeland High School, Class of 1952. He served in the United States Army, being honorably discharged from the U.S. Army Reserves after attaining the rank of Sergeant. He worked 41 years with the railroad, retiring from CSX Transportation in 1996. Jeff is survived by his daughter, Vicki Spears of Lakeland; son Glenn James (Mary) of Polk City, FL, granddaughter Brittany Spears of Newport, NC; and 26 nieces and nephews. In addition to Barbara, he was preceded in death by his parents, L.J. and Clemmie James; brothers Dewey, Howard, Vernon, and Marshall; and sisters Daisy Blondena, Gilda, and Evelyn. Visitation at Gentry-Morrison Funeral Home, 3350 Mall Hill Drive, Lakeland, FL 33810 on Saturday, May 20, 2017, 10:00 a.m. - 12:00 p.m. In lieu of flowers, please make a donation to Alzheimer's disease research, Vitas Hospice or Florida Sheriffs Boys Ranch. Speaking to a captivated audience, Drew presented the the history and theory behind satellite communication. Later the group retired to the outdoors where he put theory into practice. In the space of a few minutes he made a contact with a ham in Texas.Then, wishing to share the fun Drew got Liam KM4STS to participate. 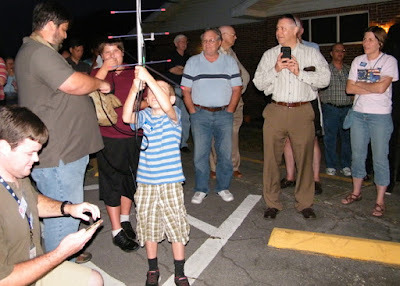 Liam KM4STS makes the call while Drew aims the antenna. and Liam's mom, dad and grandpa, all hams, look on. In his presentation Drew discussed the history, theory, and practice of ham radio satellite communication. It was made clear that it doesn’t take much to get started in satellite radio. An antenna and a dual band HT will do. Two dual bands are better. For those interested, the Internet is a great place to start learning about this phase of ham radio. Besides the radio you will need a directional antenna and some idea of where the satellite you are trying to reach is at any moment. Antennas can be purchased, or if you prefer, you can build your own. The two popular brands are the Elk and the Arrow. Both are priced in the $145 dollar range. This is a lot of money if you just want to experiment to see if you might be interested in this phase of the hobby. For the cost conscious, the tape measure beam optimized for direction finding might be just the ticket. I built one of these for fox hunting, but I am told it will work with satellites as well. You can’t beat the price. So assuming you have the radio/s and a suitable antenna, how do you determine the direction to point the antenna and the frequency to set your radio? The pointing solution comes from software programs which use unclassified information collected by NORAD and passed onto NASA. From this data, these programs predict the position of the satellites at any one time. Using software like this lets you know when the satellite is in range. Most of us are familiar with repeaters and how they rebroadcast an incoming signal either above or below the received frequency. However, with satellites, the operation is somewhat different. Most satellite transponders, repeat what they hear, the up-link signal, on a another band, the down-link signal. There is another wrinkle. Because the satellite is moving it will exhibit a Doppler shift. This means that as the satellite rises its frequency will appear to be higher than published, and then once it has reached its peak, will become progressively lower than published. This shift is more pronounced on the higher frequencies. Mode describes the up-link and down-link bands used. For example Mode V/U means the up-link is on VHF, and the down-link on UHF. Mode U/V would be the reverse. Schedule is another important piece of information to have. Satellites are not always on. However, schedules are published for each. It is a good idea to check ahead of time. Click on the above link. This will take you to the AMSAT site. Read about its history and discover the frequencies it operates on. Click on Predict and a table similar to the following will appear. AOS Azimuth – the location of the satellite in relation to true north as it just pops over your horizon. Maximum Elevation is the maximum height of the satellite above the horizon in degrees. Max EL Azimuth is the direction relative to true North when the satellite is at its highest point on the horizon relative to your position. LOS Azimuth stands for the direction relative to true north when the signal will be lost. LOS(UTC) is the Greenwich Mean time the signal will be lost. So on May 6, at 14:54:36 AO-85 just popped over the horizon for someone living in Lakeland. The direction was 226 degrees from North. After about 5 minutes the satellite reached a height of 32 degrees above the horizon at a direction of 311 degrees from North. Finally, the satellite disappeared over the horizon about five minutes later at a direction 15 degrees from North. Finally, by clicking on View the current location of AO-85 you can get a plot of where it is and where it is expected to be in the near future. If this information gets you interested in satellite communications, it has done its job. 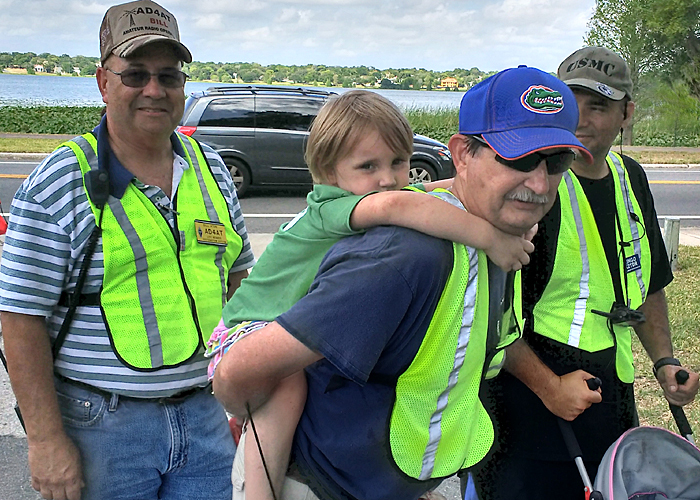 Several of our club members are heavily involved with this mode of operation. Two in particular are Matthew KK4FEM and Rich N4ESS. I am sure they would be happy to share their experiences with you. You don't have to pay $145 for an arrow. The least expensive one they offer will work fine with 2 radios (it doesn't include a duplexer) for $90. Also, if you purchase any of these things through the amsat store, they get a percentage of the sales to support operating and building more satellites. We also highly recommend AGAINST using tape measure Yagis for sats. These may have worked fine in the past for birds with stronger down links, but with the current fleet of sats people will just be frustrated trying to use them. They don't have enough gain, especially on 70cm to allow people to copy the downlink effectively. 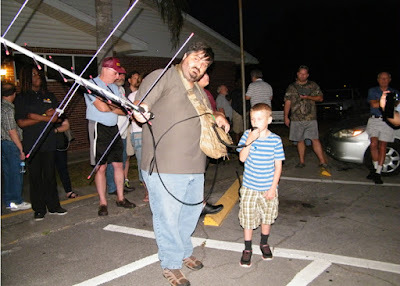 A much better alternative if folks don't want to shell out the cash for an Arrow or Elk is the WA5VJB "cheap yagi" that drew mentioned during his presentation. This can be built using scrap wood and common house wire for almost no money. Here is the info. 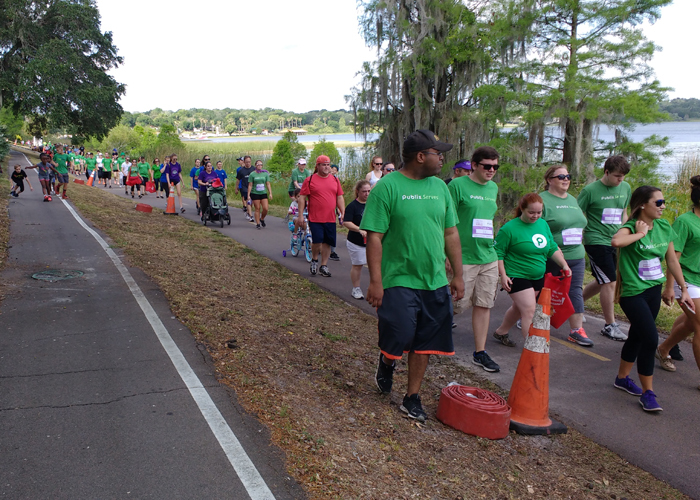 March For Babies 2017 Was A Success! The club was well represented with volunteers, as usual. No mishaps this year, but we did have one little gal that needed some assistance. She was too tired to walk and mom had her hands full with her sister. I think she may have been saving her energy for the inflatable playroom available to the kids, after the walk. Jim Stewart brings new meaning to going the extra mile. 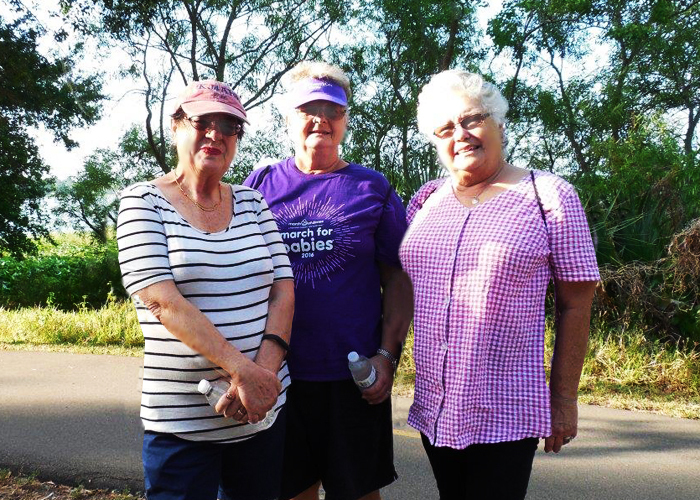 As in past years, LARC Ladies participated in the walk. There is nothing like a little walking to get you into shape. Also, as in previous years, Publix was well represented.